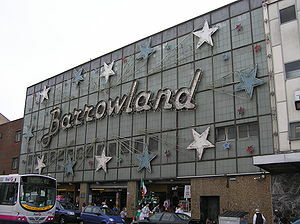 Glasgow Barrowland Ballroom (also known as Barrowlands) is a dance hall and music venue located in Glasgow, Scotland. The original building opened in 1934 in a mercantile area east of Glasgow's city centre, built by Margaret "Maggie" McIver (née Russell) (1879-1958), "The Barras Queen". The "Barras" street market (more properly Glasgow Barrowland market), after which the area and the ballroom are named, continues until the present day. The building was largely destroyed by fire in 1958, leading to a complete rebuild. The rebuilt ballroom opened on Christmas Eve 1960. The Barrowland building includes large street-level halls used for the weekend markets, with a sizeable weatherproof hall above. The front of the building is decorated with an animated neon sign. The sign is believed to be the biggest of its kind in the UK, although this cannot be confirmed as the original order documents detailing the specifications of the sign have been lost. In more recent years the Ballroom has become a major concert venue with a capacity of around 2,100 people, known for its acoustics and its sprung dance floor. Simple Minds filmed the video for their 1983 hit single, "Waterfront", at Barrowlands. Oasis, U2, The Stranglers, The Clash, The Smiths, Big Country, Muse, Foo Fighters, The Vatersay Boys, Skipinnish and Marillion have all played at the hall. Adjacent to the Ballroom itself is the Barrowland Park where there is a pathway which features the names of many artists who have played at the venue over the decades. Northern Ireland punk band Stiff Little Fingers have played to a sold out crowd every St Patrick's day since 1992, and recorded their Best served Loud album there in 2016 to celebrate 25 years at Barrowland. Between 1968 and 1969, three young women (Patricia Docker, Jemima McDonald and Helen Puttock) were found brutally murdered after nights out at the Barrowland. All three murders were attributed to a man dubbed "Bible John" by police after he was heard referring to the Old Testament to one of his victims. Similarities between the murders led police to believe that they were the work of the same man. All three women were charmed at the Barrowland Ballroom; all were escorted home and were raped and strangled within yards of their doorstep. All three women were menstruating and their handbags were stolen. An investigation failed to find Bible John, and the murders remain unsolved. On the night of the murder of Helen Puttock, Puttock's sister Jeannie Langford was with her and she spoke to her sister's suspected killer. Jeannie described Bible John as: "25-35 years old, reddish/fair hair, wore a blue suit and matching trousers with white shirt. Spoke very politely and was very religious". In 2007 following the murder of Angelica Kluk, speculation arose that serial killer Peter Tobin was Bible John. There are similarities between both individuals' modus operandi. Tobin frequented the Barrowland regularly and moved to Brighton in late 1969 when the killings ended. The Barrowlands 2 is part of the Barrowlands ballroom and is used both as a bar when larger shows are playing in the main hall and also as a venue itself to host smaller gigs. While it occasionally plays host to smaller or acoustic gigs from more established acts, its usual function is to give small bands local to Glasgow a performance stage. The promoters also host an event showcasing unsigned local talent in the main ballroom every year, selecting the best of the acts from the year and giving them a chance to play on the "big stage". The "Barrowlands" features heavily in the 2015 movie The Legend of Barney Thomson, directed by Robert Carlyle. Scottish singer Amy Macdonald has a song about the ballroom, titled “Barrowland Ballroom,” off her album This Is The Life (2007). The edifice appears in a number of scenes in The Field of Blood (TV series), a British crime drama television series. ^ Chadha, Linda. "Maggie McIver - Glasgow Women's Library". womenslibrary.org.uk. Retrieved 23 January 2017. ^ "The History of the Barras Market". glasgow-barrowland.com. Retrieved 23 January 2017. ^ "Maggie McIver". womenofscotland.org.uk. Retrieved 25 July 2018. ^ "FindArticles.com - CBSi". Retrieved 23 January 2017.